Private companies exert considerable control over the flow of information on the internet. Whether users are finding information with a search engine, communicating on a social networking site or accessing the internet through an ISP, access to participation can be blocked, channelled, edited or personalised. Such gatekeepers are powerful forces in facilitating or hindering freedom of expression online. This is problematic for a human rights system which has historically treated human rights as a government responsibility, and this is compounded by the largely light-touch regulatory approach to the internet in the West. 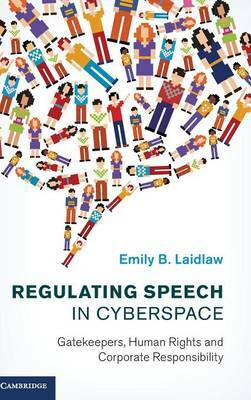 Regulating Speech in Cyberspace explores how these gatekeepers operate at the intersection of three fields of study: regulation (more broadly, law), corporate social responsibility and human rights. It proposes an alternative corporate governance model for speech regulation, one that acts as a template for the increasingly common use of non-state-based models of governance for human rights.